A cop from Yerwada jail in Pune where Sanjay Dutt was remanded to custody was suspended for hugging Sanjay Dutt when the latter was released on bail. Seven others who shook hands with him as he proceeded towards his waiting car, are in the dock as well. The visual shown on television channels irked some of our bird brained politicos who pompously declared that this was against protocol. Sometimes seeking refuge in vague inexactitudes at other times piously abiding by the ‘word of law’ is a mastery solely reserved for our honorable politicians. “Dutt’s behaviour in the jail was exemplary and he won the hearts of jail staff members. The staff members became his friends and came out to see him off,” said a senior jail official. An enquiry, which otherwise involves aeons in more critical instances, was conducted with alacrity on the matter, Result..cop suspended! This over the top reaction to a rather innocuous display of what might have perhaps been a ‘moment in the sun’ in the staid, dull life of a duty cop was uncalled for and hardly deserving of the stringent action from the superiors. After all Dutt had been released on bail, and it was not as if he had been going in for serving a sentence. Besides, arent cops human too? He might have wanted to gloat about this to his friends and neighbors at the ‘close proximity’ with the star and what is wrong with that? Definitely better than having secret liaisons with Dons!! How come those cops and those enquiries meant to unmask covert operations never seem to end conclusively?! Ironically, a cop in Bihar, tied an alleged thief to his motor bike, after he was mercilessly beaten and belted by furious mobs, and dragged him naked on the streets until he fell unconscious. This was a more deserving incident for suspension of a cop who acted beyond the ‘call of duty’. Concurrently running is the news of JMM chiefShibu Soren the till-now-accused-murderer-recently-released and the IAS officer who dived to touch his feet, while Soren barely registering his presence, continued talking on his mobile. Pyschophancy is a way of life which hardly merits attention, while a genuine hug or show of affection is worthy of rebuke, disdain and severe punishment!! Our Ministers either hate cops or love them depending on a myriad factors ranging from greasy palms, to greedy eyes, satiated bellies, hungry minds and what is dished out when! This poor cop fell prey to one of the above and like a pawn on a chessboard flicked off as a neat move!! It’s heartening seeing you back in action, once again ! My sincere wishes for a speedy r e c o v e r y. Please take very good care ! Very true.We witnessed cops barbarious behaviour in Bhagalpur just yesterday n this incident took place in the entire media presence… just imagine the plight of prisoners(excluding high profile ones)inside the jail, look at the blasts in Hyderabad recently where they have failed miserably.Ofcourse , in future there ‘ll be many such instances where they’re gonna fail.They have more important things to do than focus on petty issues . exactly Kaveetaa.. n vot about the Ministers who go around hugging him. Why the fuss? as if he is a pariah! Its not as if the judge who is sentencing him is showing affection for him. That can be objectionable. And the Bhagalpur cop..it was chilling..actually a bit 2 graphic. The channel was having a great time gathering their trp..sickening. What is food for one, is poison for the other. In Sanjays case the poor cops were either suspended or dismissed for hugging , but the officer who ran to touch the feet of SHIBU SOREN , deserved what? When we compare Sanjay and Shibu. both famous , former an actor who is loved by all, but a victim of circumtances and the latter , a shrewd politician who does every possible act of injustice tyranny and goes free .Our judiciary ,by sentencing Sanjay is making a desperate attempt to prove that every one is equal in the eyes of law but is it really true ? Can the common man be fooled or satisfied .Sentencing Sanjay and dismissing the cops is not what we want .We desire to see , something more, like a shrewd politician being punished for his misdeeds . We have read your posts on ‘Sachiniti’and are impressed to say the least. We find them thought provoking,honest and like your style of writing. The purpose of my comment is to request you to get in touch with us at the email address provided. We are compiling a list of well written blogs and publishing them on a site. Our patrons include top citizens of the country as well as some well meaning politicians. Thank you so much for your concern. It has taken me a while to accept things.Finally decided to give it a shot since I know it would have made my mother really happy. She used to quietly watch me while I was on the keyboard waiting to read some of my posts. Later in the day when my son or hubby returned home, she’d quote and cite what I had written and praise me to the skies while I laughed at the lavishness of her comments, reminding her that for a mother her children are always the best, while in actuality it may not be so…but she’d insist. I know she would have wanted me to get back to writing and going about life with positivity. So am trying to do just that. Hi Laxmi..The Bhagalpur incident is so unbelievably cruel especially when one considers the fact that the lensman capturing the agony of the victim for over an hour chose to do just that.. capture it on camera instead of admonishing or being of help. It makes one wonder whether media persons take an oath of apathy before they get into the profession..how can any right minded citizen be thinking of TRP’s at such a time? Hi Neha..yes..that is a valid point. In a democracy like ours those more equal than others, namely our Ministers are a law unto themselves. long time.. and time passes by in the sound of silence… well, cant say life has been fair but then had been bottled in mi own portion of questions of/from life 🙂 hope ur doing gud n ya.. the scribblez r bac wit the feel n taste as before!! ‘when will they ever learn…’ politics n the politik-mongers have become a death knot arnd us.. the sibu soren pranam snap on papers was pathetic n there u suspend cops for a hug… what do these bunch of dhoti clad,half-wit people want outta us? how many articles, how many campaigns, movies, theatres, deabtes, shows or even books wud it take to wash them off their muck! isnt it a violation of the freedom of expression? aint it his legal, fundamental rite to feel for or connect to someone- whoever it be!! justice is really a blind doll in the indian system.. u never grow too old playing arnd with ‘it’ n if lucky lucy favors.. u get a decision/judgement/sentence when time wud have drowned the memories.. n here u suspend him coz of a hug!! n then they talk of gandhi-isms n non-violence… dare u sign a nuke deal wit us of a!! man… whatz the point? watz the sense in blowing hot n cold over such a simple issue.. nehi.. indian netas have watch-ful eyes n surely they run the country wit an ‘iron hand’… fancy way of insulting n wrecking a personz life… now how wud he make a living?? who cares nah… the weather-vane of life never tells u when calamity wud strike 🙂 of the people, by the people n for the people…lost in translation?? guess they wrote the constitution in angreeji n then cudnt quite get it rite in the national language.. wohi.. whoever asked for a lil education for the politico?? 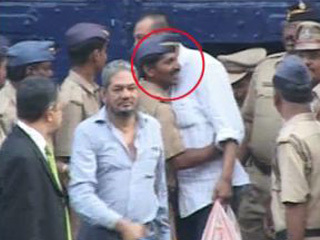 As for the now bechaara bekaar cop.. Gandhigiri got him berozgari! What a nation of hypocrites we are.